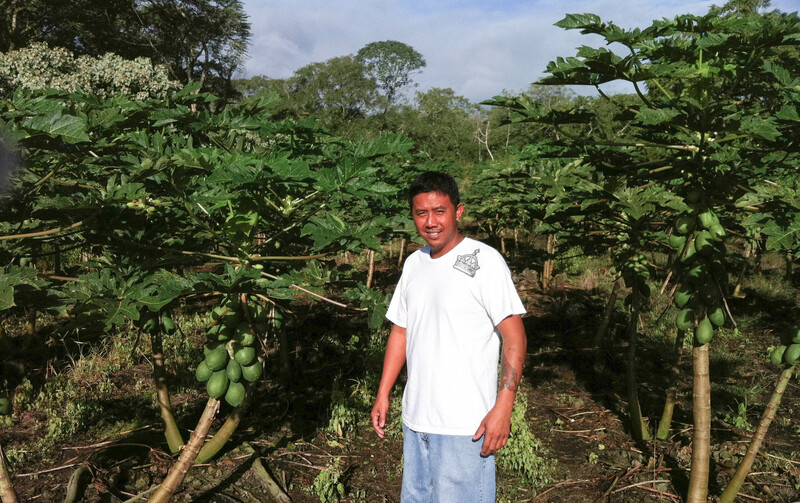 Ross Sibucao’s grandfather emigrated from the Philippines to grow papaya. Ross tried working as an auto mechanic but moved back to the Puna area where he was raised to help his father farm papaya. Now, he and about 200 mostly small-scale Hawaiian farmers produce papaya for the world market. Now in his 30s, Sibucao sports an elegant tattoo on his left forearm, where the skin has been darkened by long hours in the field. He proudly described it as a picture of the chain of Hawaiian Island and the Hawaiian state flag. “Even though I’m of Filipino descent, I’m Kama’aina [a child of the land] to the islands, being born and raised here on the Island. It represents where I’m from,” says Sibucao. Papaya, Carica papaya, is the sole species in the plant family Caricaceae, a tree native to the American tropics. A single seed can produce fruit the same year and annually produces dozens of fruits rich in vitamins and dietary fiber. As with all plants, papaya attracts a whole suite of pests. 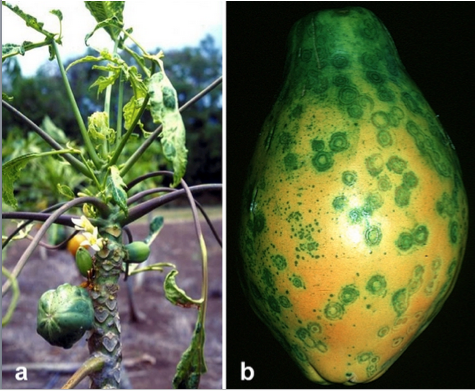 By far the most devastating is papaya ringspot virus or PRSV. The state of Hawaii has been the main domestic papaya producer for decades and most of the fruit came from Oahu Island. PRSV first showed up there in the 1940s. After a decade, the virus was severely limiting production by disfiguring the fruit and stunting or killing trees just months after infection. PRSV is transmitted by aphids, a common insect pest that plagues backyard gardeners and commercial farmers alike. A single aphid feeds on an infected tree, picks up the virus in seconds, flies to a healthy tree and inoculates the tree with the virus as it searches for its next meal. Spraying the aphids that transmit the virus is ineffective, expensive and harmful for the environment. PRSV triggered a global search for papaya plants with natural resistance to PRSV to crossbreed with commercial papaya, but the search was futile. Hawaiian papaya farmers tried to outsmart PRSV by relocating their farms to the Puna region on the Big Island, 200 miles from the infected trees in Oahu. The exodus worked for a time and, by the 1980s, Puna farmers were producing 95 percent of the state’s papaya, the second most valuable fruit crop after pineapple. However, in 1992, the aphids, loaded with PRSV, found papaya in the Puna area. By 1994, the Hawaiian Department of Agriculture declared PRSV uncontrollable. In less than three years, one-third of the papaya in the Puna area was infected. Dragging a burning tree through a papaya orchard is not a useful management strategy for aphids but illustrates the sense of hopelessness felt by Manuel, a typical smallholder farmer in the Puna area who had a family to support. The papaya growers themselves could not fund the crop’s rescue. Papaya is an “orphan crop,” a designation for plants typically neglected by big seed companies because they do not generate enough revenue to make them profitable. Orphan crops are not as profitable as corn, soybeans, canola, cotton and sugar beets, which are grown on vast acreages that allow a return on research investments. But orphan crops are the ones most commonly grown by smallholder farmers globally. They include papaya, banana, cassava, eggplant, leafy vegetables and dozens of other fruits and vegetables like plums and Mataoke banana. These crops are staples in millions of people’s diets and are essential for human health and food security, yet they are under siege from devastating pests, especially insect-transmitted viruses like PRSV. Given the high costs of research, companies leave most work on orphan crops to scientists who work in the public sector — not-for-profit universities, international plant research institutes or government agencies. For papaya to be saved, it needed someone at a public institution to take up the challenge.